Wow! 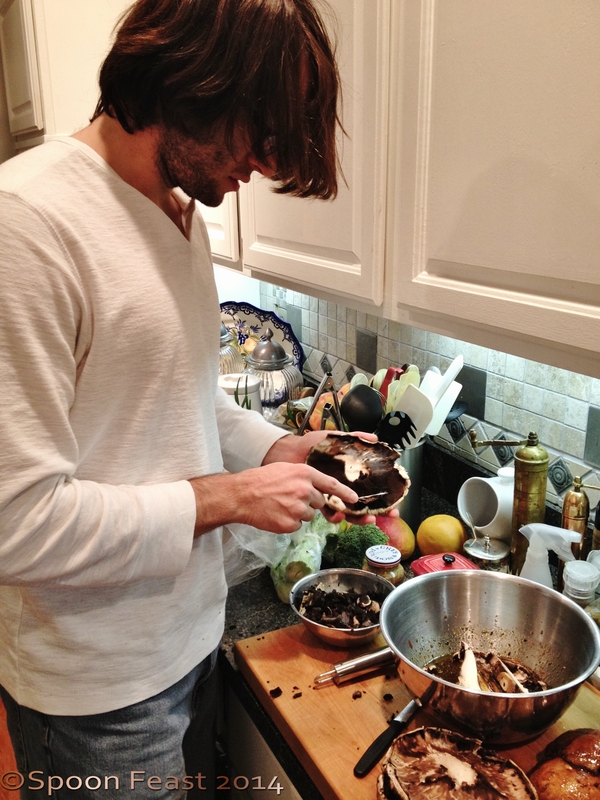 A New Year already and another In My Kitchen Post for January 2014. Shout out to Celia who is the host of this wonderful series! My kitchen was quite busy in December. This year, I decided to make Spa Baskets for the women of the family and Kitchen Baskets for the families. The spa baskets were such fun! I got to play with making bath fizzies, lip balm, body butters and lotions. I had a blast. We went to a holiday party where they passed out bags of organic produce as we left. 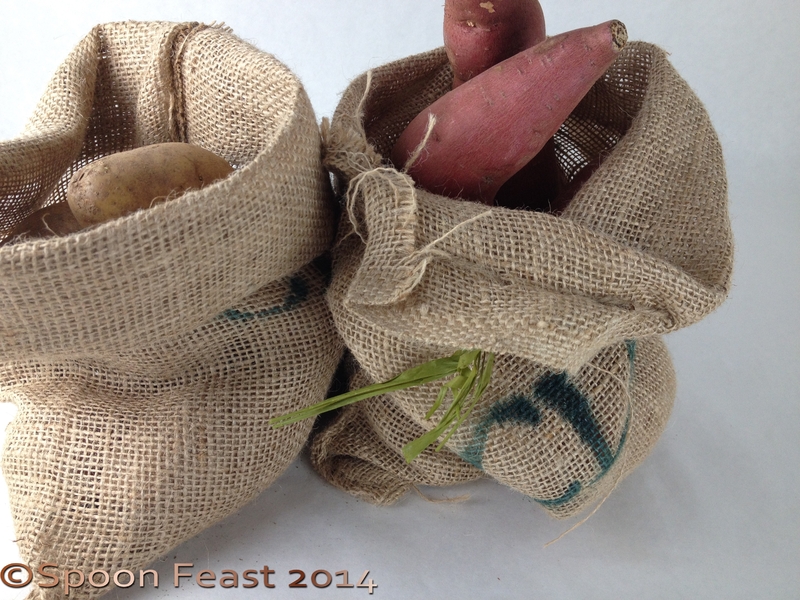 The bags were made of this nifty burlap that make perfect places to store potatoes in the cabinet. I am strangely drawn to them. 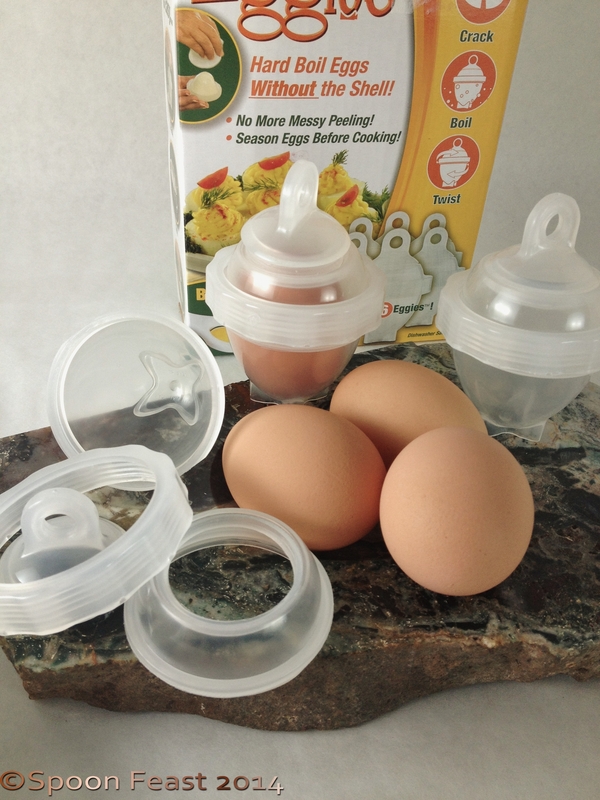 Like Joanne in her January INK post, I too got some things to cook hard-boiled eggs in only this package is called “Eggies” while hers are “Easy Eggs”. It doesn’t matter but I haven’t tried them out yet. Tyler is in my kitchen! I swear he’s grown another inch! It’s been wonderful to have him home. He goes back to grad school Saturday; we will miss him. In November, I started taking a class on Learning Herbs. 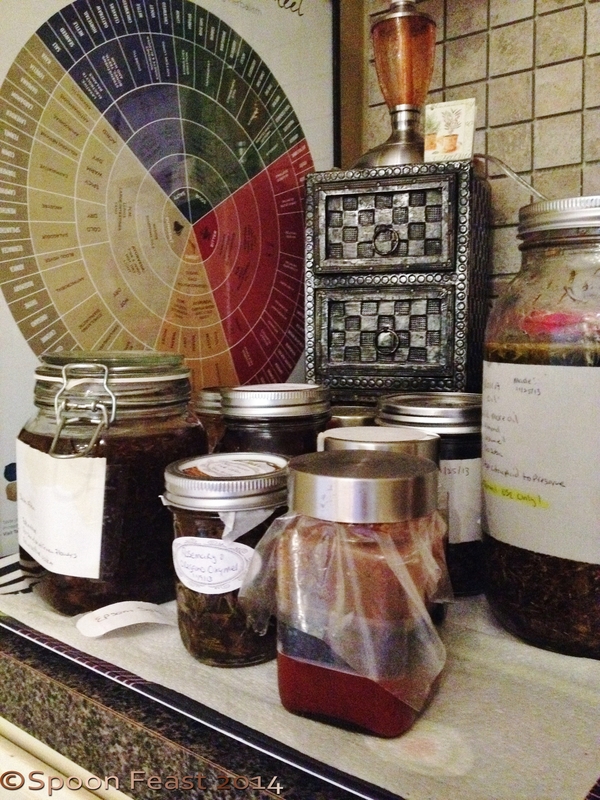 I got to set up an area just off the kitchen to house all my new ingredients, tools, tinctures and all the great fun stuff needed for the lessons. I really like my little herbal nook. Spring can’t come too early, I want to plant some herbs! 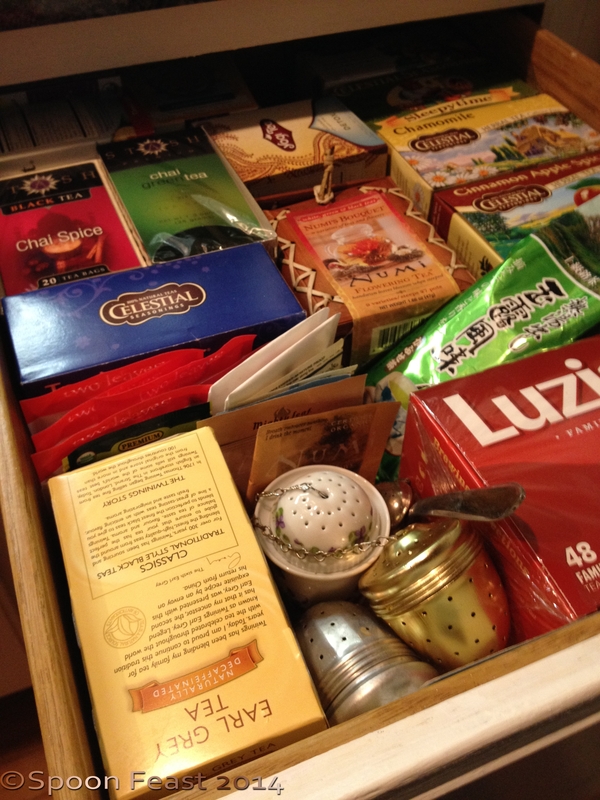 In my kitchen is an entire drawer devoted to tea. Since getting the tea pots and cups out of storage, we’ve been making and drinking a lot more tea. I change teapots every week or so. We have two pots brewing almost all of the time. One for regular black tea which gets used mostly for iced tea or the occasional cuppa with a cookie or two. The other pot is for an herbal tea, kept under a cozy to keep it warm as long as possible. Lately the tea finding its way into the herbal pot is Earl Gray. I love it with a thin slice of lemon and a small bit of sugar, in a china cup , of course. If I could find fresh bergamot, I’d be in heaven. 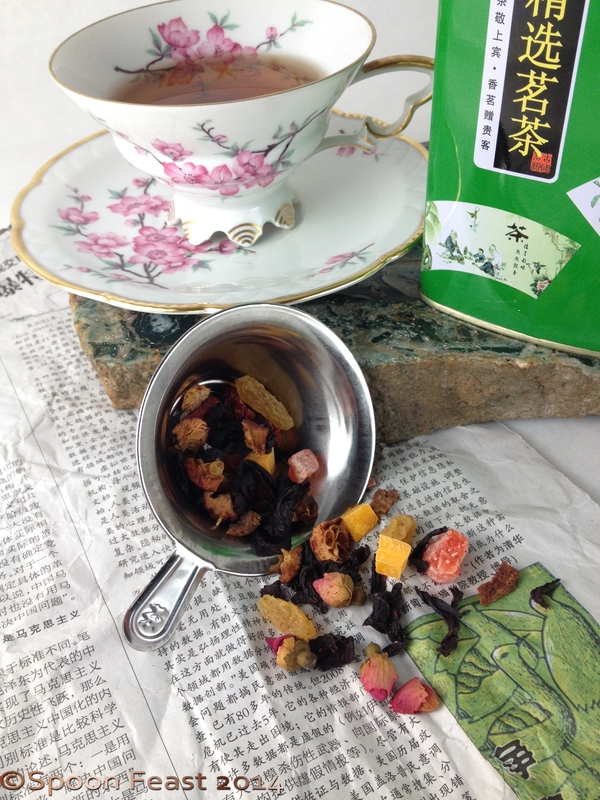 A student of mine and his wife took a trip to China and brought me back this lovely tin of “Fruit Tea” with the strainer. 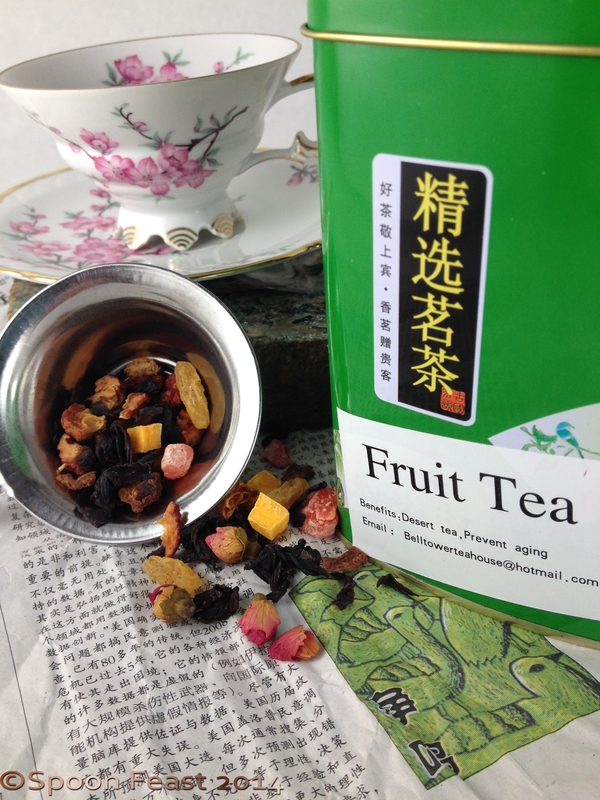 Chinese Fruit Tea, love the label! Since we’ve started drinking more tea, I’ve realized a new tea cozy or two would come in handy and have decided to make a couple. I haven’t started that project yet. This morning, I saw the adorable knitted tea cozy on Celia’s IMK post with knitted olives! I know I won’t be that elaborate, or even knitted but I’m looking forward to seeing what happens. I used to quilt and embroider and tailor so who knows what the tea cozies will look like! Anyone out there ever make a tea cozy? What do yours look like? Do you have a pattern or tips you can share? It’s about to get real cold here in the next week. Down to 8°F which to me is unthinkably cold. I’ll be staying in so maybe working on those cozies may come about. Here’s to drinking more tea! Keep comfortable where ever you are. I’m ready for a great new year, how about you? This entry was posted in Cooking Thoughts, In My Kitchen, Recipes and tagged In my kitchen. Bookmark the permalink. I don’t know where you are Sue, but here, in NC it’s not above freezing today. Full tea pots all day and a nice fire. I actually took a nap under some warm cozy blankets. Ahh! As long as I don’t have to go outside! Pam, that was Glenda’s IMK post with the knitted tea cosy – mine had the crocheted teapot handle! 🙂 They were both very cute though! And I’m a huge tea drinker – my boys both drink black tea (one likes English Breakfast and the other Irish Breakfast), but I’m a big fan of Turkish herbals teas. My current favourite is fennel tea, which I find very stomach soothing, and a bright red apple hibiscus blend. Must get back into the Earl Grey, I do love that too. Thanks Lizzy! I really like those burlap bags for some reason. Happy New Year! What’s interesting is the tea has whole tiny rosebuds in it. The flavor is nice and complex on many levels. Thanks Lisa and happy New Year to you too! I’ll probably try it when I make deviled eggs next. It is probably a bigger gimmick than it is worth it. We’ll see! Tea = life to me 🙂 Great to look round your kitchen. Interesting tinctures. Thanks Sally. the tinctures should be ready in a week or so. I can hardly wait to have them ready to use! 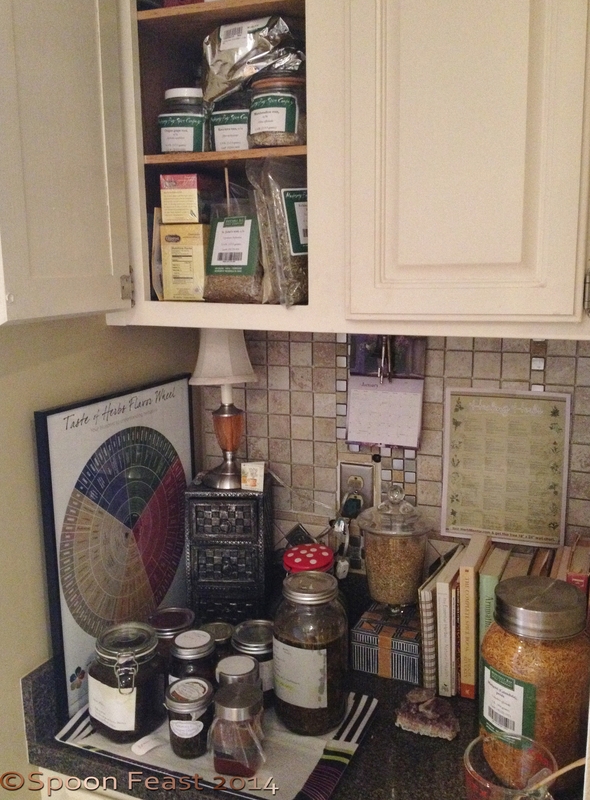 I bet that tea drawer has a scent like heaven! Yes, it really does. Sometimes I think I would be really happy in a tea shop surrounded by tea and herbs everywhere! I knitted a couple of cozies- they weren’t made from a pattern- just knitted and purled two panels, sewed them top and bottom to make space for handle and spout and then knit a round to fit on top. It looked like a pumpkin so I did it in peaches and orange hues. http://www.heidiannie.com/gift-away/ – take a look and see if this is what you want. The cozies are so cute! Esp. the cup one. Thanks so much! Yes, I saw that tea cozy too and thought ‘how cute’. I don’t even drink tea! Still, I’m impressed by your highly organised tea drawer. I look forward to reading more IMK adventures in 2014. The IMK series is quite fun, I really do hope you check more of them out. Thanks for stopping by! Hi Pamela, that tea drawer is very impressive! I look forward to next month and seeing if you or Joanne have had any luck with the eggies. Thanks Jason! Needless to say I love tea. The eggies may get tried out today when I make some snacks for today’s big game here is Charlotte, Go Panthers!